The flights are booked, accommodation sorted and archive ‘to do’ lists piling up… it’s almost research trip time! In a month I’ll be back on the long haul flight to Oz, keen to revisit some of the libraries, museums and archives that I worked in on my previous trip, as well as new ones in Brisbane and Sydney. This time round I’ve been able to arrange my trip to coincide with two conferences, the ‘Entangled Histories’ Australian Historical Association Conference in Newcastle, and the Australian and New Zealand Society for the History of Medicine (ANZSHM) Conference in Melbourne on the theme of ‘Health, Medicine and Society: Challenge and Change’. The AHA Conference feels like something of a return, as the last one I attended was in Adelaide in 2012, a few months before submitting my PhD thesis and shifting base to the UK. The 5 (gosh, 5!) intervening years have flown by, and with them have come some big changes, one of which will be coming along in the form of my 1 year old ‘research assistant’! I am fortunate that Australia is also ‘home’ for me, so bubs will get to enjoy time with family while I enjoy time with colleagues. The paper I’ll be presenting is based on some of my favourite sources from the project – oral histories and material culture, which together shed light on interactions between migrant patients and Australian medical professionals in the immediate post-war era (more in the abstract below). Draft programmes for both conferences arrived in my inbox this week, and there are so many papers I am excited to hear, colleagues I’m looking forward to catching up with and others I hope to meet. The countdown has well and truly begun – see you soon Australia! This presentation showcases a piece of medical equipment brought to Australia in 1958 by an Italian woman, and now held in the collections of the Migration Museum in Adelaide. Bound up in this one small possession are beliefs about race, culture and difference which shed new light on encounters between migrants and medical professionals in post-war Australia. At a time when images of young, healthy ‘New Australians’ were key to the acceptance of the Government’s radical immigration scheme, the actual experiences of those migrants who navigated Australia’s health systems and medical culture were, and have since been, largely overlooked. I argue that personal objects, together with oral histories and written memoirs, can reposition migrants as active agents in the maintenance of their own health and that of their loved ones, rather than the passive subjects of medical expertise and government policy. Health shapes every stage of migration. But while immigration processes such as medical screening and quarantine leave a bureaucratic cache in the archives, encounters between migrants and the medical system in primary care settings are recorded in only scattered and diffuse ways. Likewise, personal or familial efforts to maintain health and wellbeing whilst establishing working lives in a new country leave little documentary evidence. Yet health continues to be important beyond national borders, both in the early years of settlement and throughout the life course of individuals, families and communities. To better understand the role that health plays throughout the migration experience, this paper presents emergent findings from a study of oral histories, life writing and material culture yielded by people who journeyed to Australia during the peak years of the post-war immigration programme. These personal accounts are contextualised by the contemporaneous writings of medical professionals and grey literature from government departments and social scientists concerning ‘migrant problems’. The study enhances a growing literature on the gaps between immigration and settlement policies, government rhetoric and the lived experience of migrants in the period. I argue that a focus on health can provide a unique insight into the ways migrants navigated mid-twentieth century Australian society, attitudes, institutions and cultures. Such an approach can shed new light on structures of power which shaped the ways migrant patients were perceived by medical professionals and limited their access to mainstream healthcare. This entry was posted in Healthy Citizens?, Uncategorized and tagged AHA, ANZSHM, Australia, health, material culture, migration, oral history, research on May 26, 2017 by eurekahenrich. Which objects do we most often associate with historic and contemporary migration journeys? Ranking highest in most people’s responses is usually a suitcase or travelling trunk. The migrant as someone carrying their life in a case is both a poignant and easily understood symbol, so it is easy to see why it has come to represent human migration as a kind of visual shorthand, eg. people + old-fashioned suitcase = migrants. Passports and other identity documents have also come to represent migration journeys across national borders, and the personal mementoes kept by people leaving home indefinitely now populate the mantelpieces and attics of countless homes, as well as the collections of migration museums around the globe. What we tend not to think of are the everyday essentials packed for comfort or health during the journey, or for use in the place of destination. When the ability to bring possessions is limited, these types of objects are prioritised over the more symbolic or sentimental. Syrian refugees whose belongings were documented by Guardian journalists last year had packed pain killers, bandages and lemons to ward of seasickness, along with water and food to sustain them on the boat journey to reach Europe. In my own research into the health experiences of migrants and Displaced Persons arriving in post-war Australia, there are examples of people who brought syringes, needles and other personal medication and equipment, pregnant women bringing bandages, dressings and ointments for the birth and care of their children, and people going to great lengths to conceal seeds and other foodstuffs important for their health and wellbeing. The uncertainty surrounding what would be available in Australia was a major factor in these decisions. These health-related objects are less likely to survive in families and be passed into the collections of archives or other cultural institutions, making them difficult to find and exhibit. The reasons are fairly obvious – the materials are brought to be used, not saved! And even when they survive, people are unlikely to recognise their potential value for researchers. The objects I’ve located so far are largely the result of museum collecting practices in the 1980s and 1990s, when government policies of multiculturalism enabled curators to secure some of Australia’s post-war migrant heritage for future generations. Other items were donated to museums by migrant’s children or descendants. But even though they are relatively few, they are incredibly important. Without personal objects, it is tempting to limit the nexus of migration and health to one which only involves screening for disease, or as a process where migrants are the subjects of government policy, rather than active agents in the maintenance of their own health and that of their loved ones. Later this year I’ll be sharing a selection of these objects and other material as part of ‘Migration, Health and Identity: Past and Present’ – the public engagement programme for my current Wellcome Trust-funded research. The website and virtual exhibition will provide a resource for others interested in the way beliefs and practices surrounding health are relevant to migration histories, and about the importance of maintaining health practices as part of our identities. There will also be an opportunity to get involved by contributing your own health-related migration story or object. Do get in touch if these themes resonate for you, or stay tuned for updates on the website and virtual exhibition in the coming months! This entry was posted in Healthy Citizens?, Migration History in Museums & Memorials, Uncategorized and tagged Australia, health, immigration, migration history, museums, public engagement, wellbeing, Wellcome Trust on May 20, 2016 by eurekahenrich. Migrant’s memories of health and illness form one of the three strands of my current research project, which focuses on the intersections between migration, health and assimilation in Australia during the immediate post-war period, 1945-1970. It is the part of the research that I have most enjoyed so far, as it gets straight to the individual, lived experience of migration – the everyday realities of dealing with layers of strange, frustrating bureaucracy, making a living and caring for oneself or family. And, as the oral history archives, collections of material culture and migrant memoirs that I’ve been drawing on attest, health experiences often remain vivid in migrants’ memories, marking moments of vulnerability, crisis, fear or relief. For instance, forty years after her migration, a mother of four, Irene, recalled round after round of medical checks in a German Displaced Persons camp, and before embarkation in Italy: ‘they checked us and they checked us and they inject us… Not only like it was in Germany, when we came to Italy they check us again. It was more frightening that way – we have some illness or something – we were very much checked. Somehow we went through’. Next Wednesday I will be presenting a paper on this research at the Menzies Centre for Australian Studies Seminar at King’s College, London, following a paper by Daniel Vaughan from Macquarie University, titled ‘A Queer Sense of Home: Australian Sexiles in London, 1945 – 1978’. I’ve been a regular attendee of this series since I first relocated to the UK in 2012, and am very much looking forward to sharing where my current research is at in such a stimulating, friendly and collegial atmosphere (which often extends to the pub afterwards!) The abstract and details for the talk are below. Do come along if you are in London and interested in either paper, no bookings necessary – the more the merrier! WHEN/WHERE: Wednesday 27th January 2016, 18.15 – 19.30, Council Room (K2.29), King’s Building, Strand Campus, King’s College London. Australia wants, and will welcome, new healthy citizens who are determined to become good Australians by adoption – Arthur Calwell, Minister for Immigration, 2 August 1945. The experiences of those who migrated to Australia in the years following the Second World War have, since the 1980s, gained increasing historical attention, yet the centrality of health to the promotion, implementation and lived-experience of migration and settlement is an aspect of this history that remains to be written. This talk will report on the preliminary findings of a research project which foregrounds migrants’ own narratives of health and ill-health, gleaned through a vast and scattered archive of oral histories, material culture and life writing held in the collections of libraries, galleries and museums in Australia and the UK. Ranging across experiences of childbirth, hospitalisation, childhood illness, ageing and work-related injuries, these sources offer precious and sometimes painful windows into the lives of individuals and families caught up in Australia’s post-war migration programme. Rather than merely the objects of government policies of selection, work assignment and assimilation, migrants emerge in these sources as subjects encountering and negotiating an Australia that was, quite often, far from the one they had imagined. Dr Eureka Henrich is a Wellcome Trust Research Fellow in Medical Humanities at the University of Leicester, where she is researching the intertwining histories of migration, health, assimilation and identity in post-war Australia. Before coming to Leicester she was a Visiting Research Associate (2013) and Rydon Fellow in Australian Politics and Political History (2014) at the Menzies Centre for Australian Studies, King’s College London. Eureka originally hails from Sydney, where she was awarded her PhD in 2012 at the University of New South Wales. This entry was posted in Healthy Citizens?, Uncategorized and tagged Australia, health, King's College London, memory, migration on January 21, 2016 by eurekahenrich. My brain is still happily buzzing from last night’s IHR Public History Seminar on the question, ‘What is public history in light of the refugee crisis?’ (a intro to the event from Kathleen McIlvenna can be found here). With thoughtful and engaging responses from the different perspectives of academia (Prof Peter Gatrell, Manchester and Prof David Feldman, Birkbeck), museums (Susie Symes, 19 Princelet Street), and humanitarian organisations (Juliano Fiori, Save the Children), the roundtable raised common problems and tensions in the representation of refugee pasts and presents. The dangers of conflating the current ‘refugee crisis’ with past crises (and perhaps even adopting that language) was a major theme – one that has been pulled apart skilfully in recent months by Jessica Reinisch. 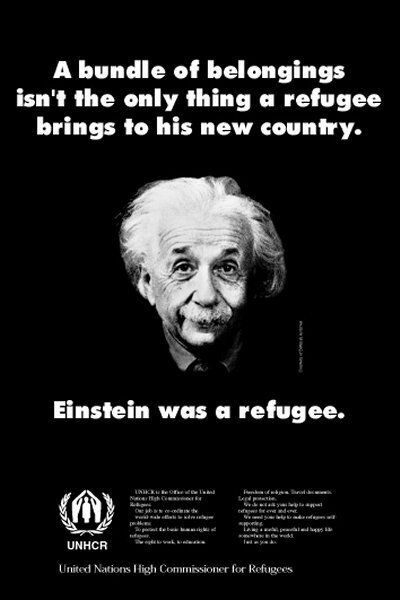 Another was the tendency in ‘pro-refugee’ discourses to emphasise refugee contributions to society (think of the UNHCR ‘Einstein was a refugee’ poster shared widely online) as justification for their acceptance – or is this, as Susie Symes pointed out, an important ‘hook’ to engage people in a conversation, and ultimately to challenge assumptions about refugees? The need to simplify these important discussions down to sound-bite or caption size in public debate means compromises between impact and context are often unavoidable. A recent example is the widespread celebration of Germany’s welcome to refugees – as Klaus Neumann shows, historical context is all too often lost in the rush for a good-news story (and a feel-good image). So how can public historians, or those making history in public, respond to current migratory movements? What role can the past play in the interpretation of the present? A starting point offered by Peter Gatrell is to look to the ‘history of the public history of refugees’. Citing examples of exhibitions and memorials that have been constructed by those who have been displaced from their homelands, by philanthropic organisations wishing to encourage public support for refugees, or by governments eager to display their histories of welcome, Gatrell asked us to consider whose voice is heard in these displays, and underlined the problem of homogenising a diversity of experience into an emblematic refugee story. Luckily, for public historians today, there is a long and rich history of individual exhibitions, memorials, and even entire museums devoted to the experiences of people who have made lives in new countries. These representations can form a kind of reference library of ideas and models for public history projects. * In the Australian context, which has been the focus of my research, thirty years of exhibitions about migration have weathered changing political climates and hardening views towards refugees and asylum seekers. Curators and museum managers – many of them migrants or refugees themselves – have made bold decisions about whose stories to record and whose objects to collect. These decisions can ultimately shape what is seen as ‘national heritage’, even though it might only become apparent decades later. For instance, far-sighted museum workers from the fledgling National Museum in Canberra in the 1980s acquired a fishing vessel called the Hong Hai for their collections. The boat was a recent arrival to Australian shores, having pulled into Darwin harbour in 1978 with thirty eight passengers fleeing Vietnam. By the time the National Museum of Australia officially opened in 2001, the 90,000 Vietnamese refugees that had been resettled in Australia during the 1970s and 1980s were an established part of Australian society, and the journey of the Hong Hai became one of the feature stories in the exhibition Horizons: The Peopling of Australia Since 1788. The display of another refugee boat, Tu Do, at the Australian National Maritime Museum in Sydney, also attests to the importance of these decisions. I wonder what objects and stories are being collected now? Katherine Goodnow, Museums, the Media and Refugees: Stories of Crisis, Control and Compassion, Berghahn Books, 2008. Laurence Gourievidis (ed), Museums and Migration: History, Memory and Politics, Routledge, 2014. Christopher Whitehead, Katherine Lloyd, Susannah Eckersley and Rhiannon Mason, Museums, Migration and Identity in Europe, Ashgate, 2015. This entry was posted in Migration History in Museums & Memorials and tagged 19 Princelet Street, Australia, Australian National Maritime Museum, Britain, IHR, migration, museums, National Museum of Australia, Peter Gatrell, public history, refugee on October 22, 2015 by eurekahenrich. What is a ‘migrant memorial wall’? When we think about memorial walls it it war memorials that most likely spring to mind – decorated with poppies or laid with wreaths, war memorials list the names of those who served, were wounded or died. In the last quarter century the ‘visual language’ of this type of memorial has been adapted for another purpose, to memorialise those who left, journeyed, and settled. Migrant memorial walls have developed alongside migration and maritime museums across the globe, offering members of the public the opportunity (for a fee), to pay tribute to friends, family members or ancestors who made new lives in a different country (there are many other types of memorials to human migration, see my previous post for a taster). The Welcome Wall at Sydney’s Australian National Maritime Museum. Photo by hopeless128, via Flickr. Migrant memorial walls have proved particularly popular in Australia. 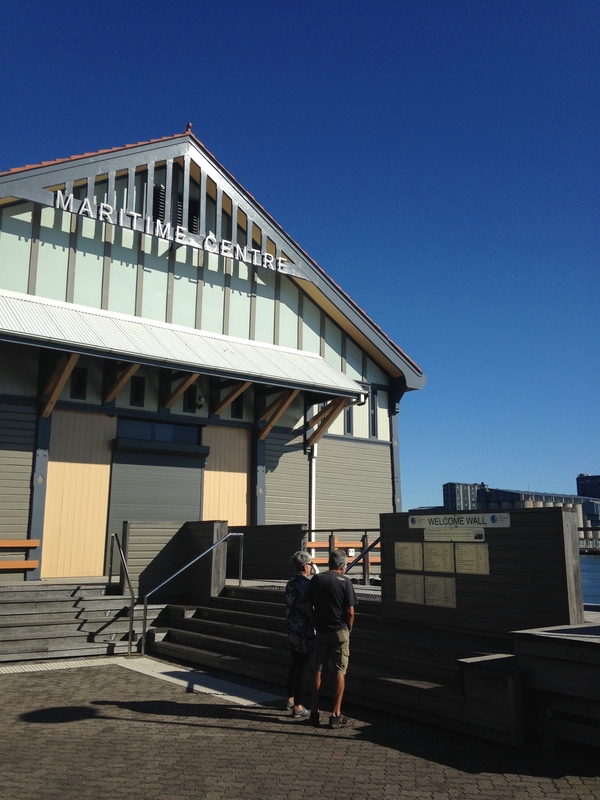 The Welcome Wall at the Australian National Maritime Museum in Sydney’s Darling Harbour was first unveiled in 1999, and now boasts more than 25,000 names. The Western Australian Museum began a Welcome Walls project at Victoria Quay in Fremantle in 2004, initially planning to display 2000 names. However, public interest was so strong that the initial project was extended twice, and by its conclusion in December 2010 more than 21,000 inscriptions had been accommodated. In Melbourne, a Tribute Garden opened as part of the Immigration Museum in 1998 features the names of 7000 immigrants, paid for by family members or descendants. And at the Bonegilla Migrant Experience, a museum and heritage site interpreting a former post-war migrant hostel in north east Victoria, relatives of ex-residents are invited to ‘help build a wall of memories’ by purchasing a memorial plaque for a Tribute Wall. While in Newcastle on the NSW central coast earlier this year, I was thrilled to find a new mini-welcome wall, initiated by the local maritime museum and including the names of residents who migrated to Australia under the International Refugee Organisation displaced persons resettlement scheme following the Second World War. Newcastle’s Maritime Welcome Wall. Photo by Eureka Henrich, 2015. So how did this type of memorial develop, and what meanings does it convey? 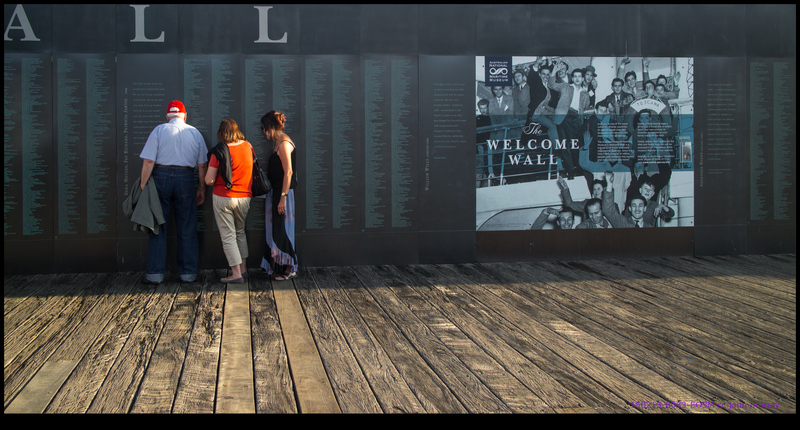 In a recently published book chapter, I trace the history of two memorials – Australia’s first migrant memorial wall, the Welcome Wall at the Australian National Maritime Museum in Sydney, and the American Immigrant Wall of Honor at Ellis Island Immigration Museum in New York, unveiled in 1990. I was interested in how an Australian museum adapted the American memorial for an Australian audience, and what social, historical and institutional contexts shaped their decisions. Most importantly, I wanted to ask what migrant memorial walls can tell us about the ways that people understand migration as part of their family histories, personal identities, and their place in the nation. The American Immigrant Wall of Honor at Ellis Island. Photo by LucEdouard via Flickr. One fascinating aspect of this work was browsing the ‘micro-family histories’ that some participants submit when registering a name for the Welcome Wall. You can read these yourself on the Australian National Maritime Museum website, either by accessing the Virtual Welcome Wall or a text-based version. In the chapter I argue that these short snippets reveal not just historical details of the person or family named, but clues as to why memorialising that person’s migration was important to them. One that stayed with me simply reads: ‘this is for my wife who has been in Australia 4 years and it will make her feel part of Australia’. 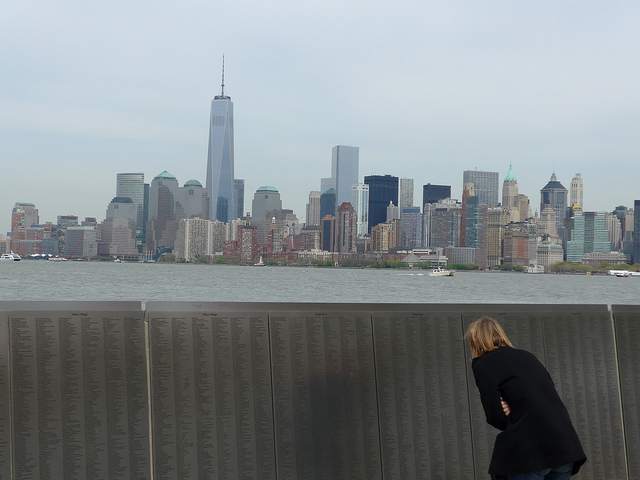 Have you registered a name on a migrant memorial wall? Or do you know about a similar memorial not mentioned here? Do let me know in the comments! And for those interested in reading the full paper, details are below. Eureka Henrich, ‘Paying Tribute: Migrant Memorial Walls and the “Nation of Immigrants”‘, in Sten Pultz Moslund, Anne Ring Petersen and Moritz Schramm (eds), The Culture of Migration: Politics, Aesthetics and Histories, (London: I.B.Tauris, 2015). This entry was posted in Migration History in Museums & Memorials and tagged Australia, Australian National Maritime Museum, Ellis Island Immigration Museum, family history, memorials, migrant memorial walls, migration, public history, United States on July 21, 2015 by eurekahenrich. Sorting the stuff: how do historians organise their research material? Digging around in archives is one of the great joys of historical research – you just never know what you are going to find. On my last research trip for my project Healthy Citizens? Migrant Identity and Constructions of Health in Post-War Australia, a pile of migrant guidebooks c.1950 appeared in a box of oral history transcripts. Searching in a museum collection database turned up surgical dressings brought by a Dutch migrant to Australia for the birth of her child. And a mystery file in the National Archives in Canberra ended up being a huge photograph album, compiled by the Department of Immigration in the late 1940s. These and many more discoveries, some more surprising than others, saw me return from six weeks of research with hundreds of jpeg files, PDF scans, photocopies, and two A4 books of messily scrawled handwritten notes. That’s when the hard work began. Transforming a haphazard trove of research material into an accessible, searchable and well-organised resource requires a set of skills that I don’t remember being formally taught as a history student. It seemed to be more a process of trial and error. Of course, since my undergraduate years a whole array of software has been developed to help sort and catalogue research material – I’ve used Endnote and Zotero in the past, but mainly for books, book chapters, journal articles and newspaper articles. For primary research, my tendency is to want material in hard copy, in folders that can be rifled through and physically sorted on a desk. But with a large volume of material of different formats and types, this approach can become unmanageable quite quickly. The system that has developed from my first haul of ‘stuff’ is a combination of Endnote records, Excel spreadsheets and transcriptions in Word documents. Excel allows me to build databases of information which offer a more ‘macro’ picture of two types of sources – objects, or material culture; and oral histories. Each of these spreadsheets breaks down the source into comparable attributes – for instance, age, gender, country/region of origin, pre and post-migration health-related experiences – and a comments field allows for a little more detail. I type up transcriptions of interviews in Word documents, and link them to an ‘associated material’ field in the spreadsheet. Dropbox enables me to store all my jpegs in corresponding folders, and I add these file names to the master sheet where they relate to particular objects or people. Another chunk of my research material is published articles in medical journals, and these lend themselves easily to Endnote, where I attach any scans and keep my notes. Working through the government archival material is my next challenge. In The Historian’s Craft Marc Bloch noted that ‘one of the most difficult tasks of the historian is that of assembling those documents which he considers necessary… He could hardly succeed without the help of various guides: archival or library catalogues, museum indexes, and bibliographies of every kind’. This is of course absolutely true. But once the material is assembled, it remains in many cases a veiled mystery what historians actually do with it. We don’t tend to write about that part – it can be messy, personal, and sometimes quite convoluted! Forced to write without his notes and sources, Bloch instead reflected on the nature of historical research and writing itself. And the more I think about it, it is the process of deciding which questions to ask, going about finding material and making connections between different sources which shapes the way I organise my files – each project requires a different approach. This one is still taking shape, and no doubt there’ll be some more tweaking along the way! Thus ends my brief reflections on this conundrum! There are many other options out there – some people use NVivo, or stick to the old card index systems. What have you found works best? I’d love to know! 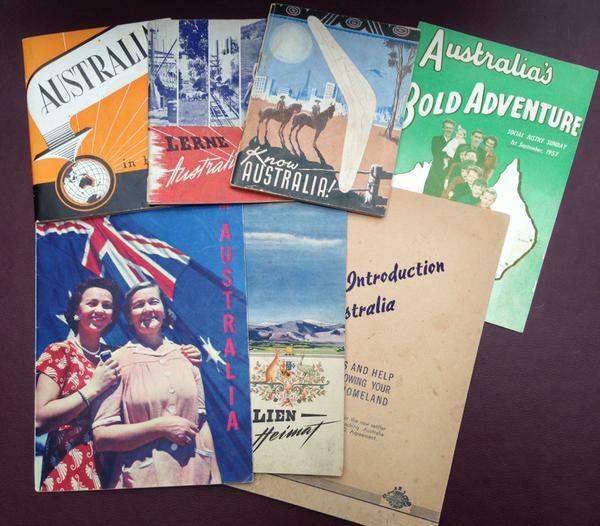 Migration booklets from the 1950s, a surprise find at the State Library of NSW. This entry was posted in Healthy Citizens? and tagged archives, Bloch, Endnote, Healthy Citizens?, historical method, NVivo, research, Zotero on June 11, 2015 by eurekahenrich. Between mass digitization and the impressive reach of inter-library loans, it is possible for historians to do more research away from the ‘archive’ than ever before. So it was especially exciting for me to recently spend six weeks in Australia, scouring national archives, museum collections and state library holdings of oral histories in a quest to untangle changing ideas about health, assimilation, and the migrant experience in post-war Australia. Most of my time was spent in the national and state libraries, in Perth, Sydney, Melbourne, Adelaide and Canberra. Being mobile meant a new workspace each week, sometimes each day, and new work-mates too – from family historians excitedly discussing their latest ‘find’, to high school students studying their textbooks, tourists enjoying the calm surrounds and free wifi and members of the public accessing computer and printing facilities. It’s a positive, humming atmosphere to work in, and made all the more enjoyable by the knowledge, helpfulness and good humour of librarians and other library staff. So to follow on from the popularity of my previous post on Australia’s top 10 migration memorials, this post will be my fab 5 of Australian libraries! Should you find yourself in any of these cities I’d highly recommend whiling away some time in any of these institutions – depending on which, there’s a recommendation of what to do, apart from the obvious (pick up a book!) Libraries are for readers, learners, dreamers and explorers of all ages. You don’t need a research plan to get stuck into all they have to offer, and there’s always someone helpful on hand to point you in the right direction. Mitchell Library, part of State Library NSW. Photo by Christopher Chan via Flickr. 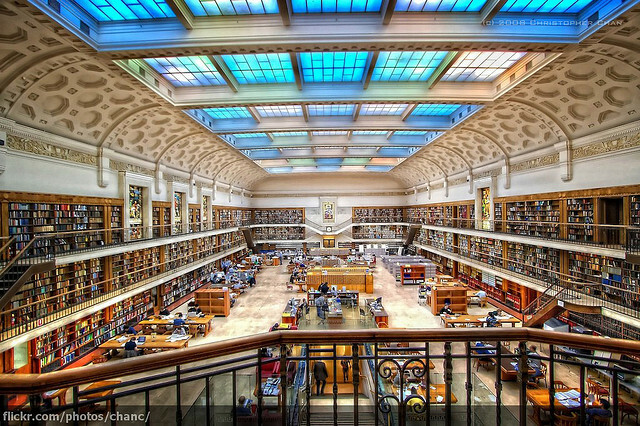 Regularly making it into the lists of the most beautiful libraries in the world is Sydney’s Mitchell Library, part of the State Library of NSW. This was my first visit since the space has been refurbished, with a barrier separating the casual library space users and those with special readers cards accessing archival material. The security seems to have been stepped up – each of my files was weighed in and out on scales with care! But the space still exudes that hushed, calm orderliness, like being inside a church. The more modern wing of the State Library, including a cafe and bookshop, can be accessed via an underpass. Although the coffee is good, I’d give the food a miss, and instead bring a packed lunch (‘sambo’ in the local lingo) to eat in the nearby Botanic Gardens. Highlights from the collection are also on display, with a chill-out area where you can curate your own exhibition! Cowen Gallery, State Library Victoria. Photograph by Indigo Skies Photography via Flickr. I’m not so secretly a little in love with Melbourne – which, as a Sydneysider, is treasonous to admit! This library captures all that’s great about the city. It’s open to everyone, without any overzealous security procedures (you’ll only need to use a locker if you are going into a special collections reading room). Materials are displayed for the casual browser as well as the studious researcher, from magazines and newspapers to glossy coffee table books and best-selling novels. And if you tire of turning pages, there are always a good array of permanent and changing exhibitions upstairs, from oil painting to illustration and photography. It also has a quirky, self-deprecating sense of humour – next to the traditional man-on-horse colonial statues at the library’s entrance are celebrated characters from Australian children’s literature, including a cheeky May Gibbs’ Gumnut Baby and Mr Lizard. Eat lunch on the benches outside watching the buzz of the Swanston Street foot traffic, or cross the road to delve into the myriad food choices of Melbourne Central. A great public building and institution. 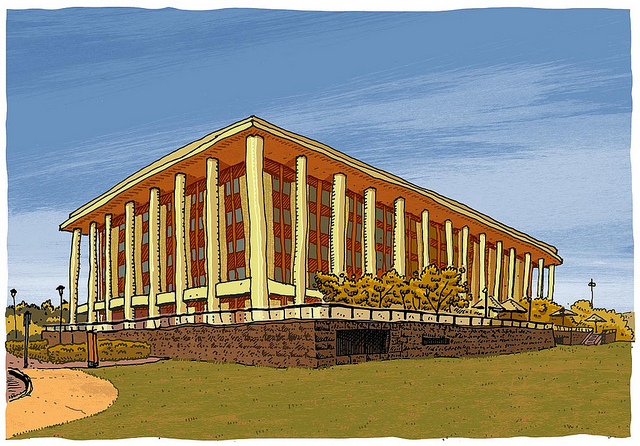 National Library of Australia, captured beautifully by Trevor Dickinson, one of my favourite artists at the moment (this one via Flickr, more on his website). Like many of Canberra’s public buildings, the National Library of Australia resembles an alien hovercraft intruding on the otherwise flat landscape. But what it lacks in charm (depending on your architectural tastes!) it makes up for in utility. You name it, the NLA has it, or can get it. Researching here is like being a kid in a candy store – especially since making copies to USB is absolutely free. The late opening hours and delicious cafe meals (if you feel like treating yourself) make it easy to spend all day on site, which is a good thing, because getting around Canberra without wheels can be a challenge! Luckily for historians and other researchers, the National Archives are a short stroll away. If you get there early and bag a desk by the window, you can bird watch and read to your heart’s content. State Library of South Australia, photograph by Jenny Scott via Flickr. If Goldilocks was looking for a library, rather than a bowl of porridge, the State Library of South Australia would have fit the bill. Not too big, not too small, the library is instead ‘just right’ – the single floor of reading and meeting rooms, desks, public computers and open access books is clearly navigable, and a quiet corner can be found without having to arrive super early or jostle with the crowds. Unfortunately it’s not possible to order archival material online, but the librarians couldn’t be more helpful in filling in the request slips (maximum five per half hour delivery slot, so plan your time carefully!) 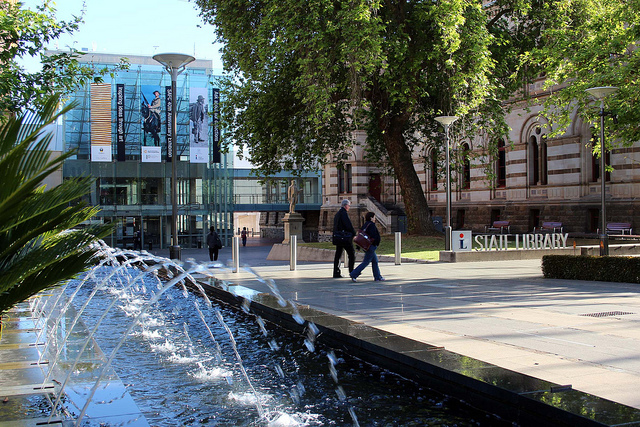 It’s also incredibly convenient to have the State Library, State Records and South Australian branch of the National Archives all in the same building, within a stone’s throw of the South Australian Museum, Art Gallery (coffee is better there than at the Library), and the Migration Museum SA. Definitely worth a visit, especially as the travelling exhibition of the New Zealand illustrator Lynley Dodd is now on show. 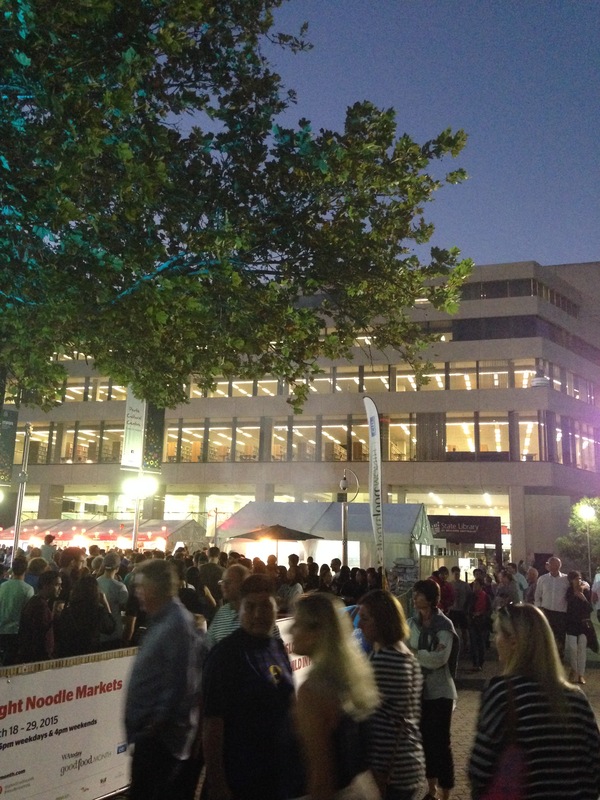 State Library of Western Australia with the Night Noodle Markets in the foreground. Photograph, Eureka Henrich. The words belong to the late historian Frank Crowley, who lectured at the University of Western Australia in the early days of Australian history teaching (1950s and 1960s), and later held a chair at UNSW, my alma mater. Sign or no, what I found was one of the most laid back and relaxed public libraries I’ve had the pleasure of working in. No need for a library card or a visitor pass, plenty of space, and amazingly, a whole room or oral history transcripts open to the public. Pulling these files off the shelf, rather than ordering each individually, was a delight. 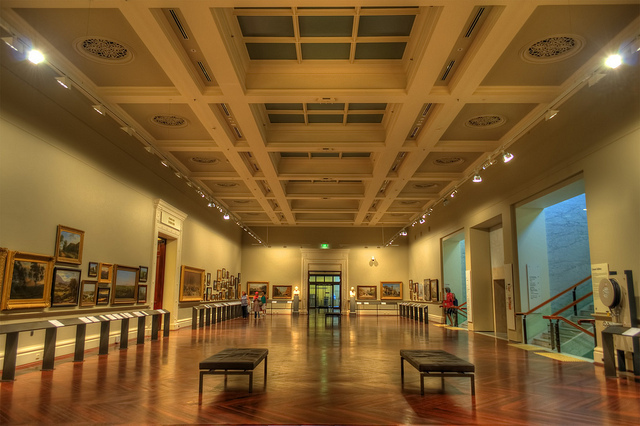 Like Adelaide, Perth has a compact cultural quarter, so there are galleries and museums nearby. While I was in town there was also a night noodle market, which smelt amazing, but after such a peaceful time in the library, I didn’t feel like braving the crowds! You can read more about the library in this lovely post on Weekend Notes. This entry was posted in Uncategorized and tagged Australia, books, libraries, National Library of Australia, oral history, research, State Library NSW, State Library of South Australia, State Library of Western Australia, State Library Victoria on May 14, 2015 by eurekahenrich.